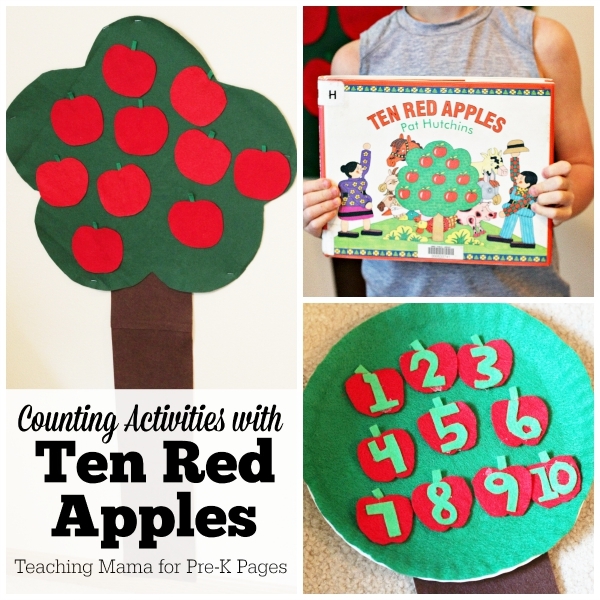 A fun way to practice counting is with the book Ten Red Apples by Pat Hutchins. I love reading this fun book to preschoolers. Today, I’ll be sharing counting activities to use with this book. Ten Red Apples by Pat Hutchins is a book about a farmer and farm animals who pick apples from a tree. They start with ten apples and count down until there are no apples left. It’s a cute book with fun phrases for the kids to recite along with the teacher. 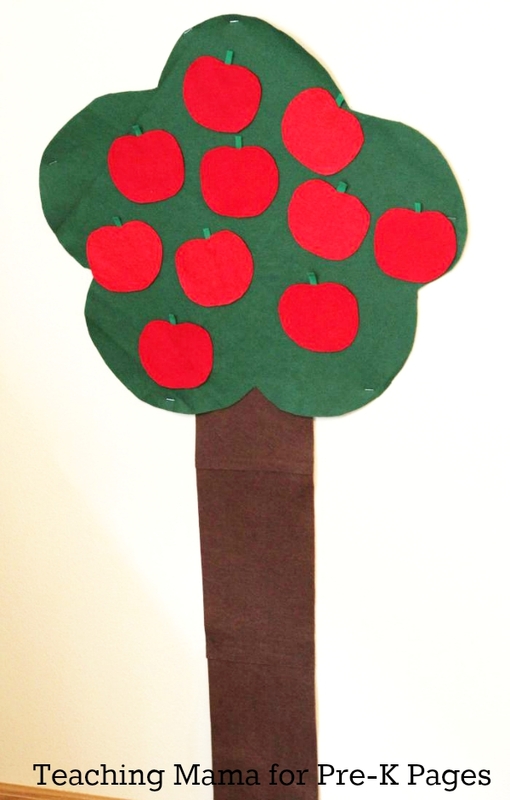 For this activity, create a giant felt tree with felt apples. Start with ten apples on the tree and as you read the story, take down the apples. 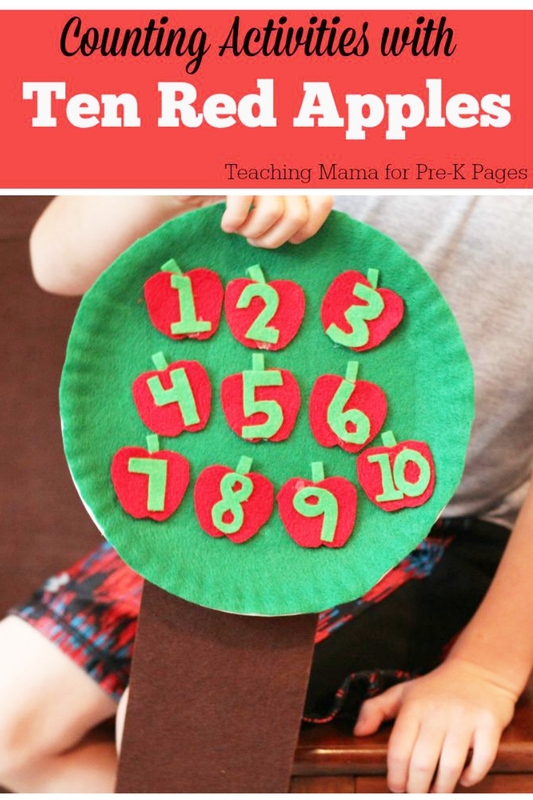 Practice counting the apples with the children after you take apples down from the tree. After reading the book Ten Red Apples aloud, have the children create their own counting apple trees. To create the apple trees, glue a piece of green felt onto the paper plate. Trim around the plate’s edge to create a circle. Next, glue on a piece of brown felt to the paper plate for the tree trunk. Cut ten apples out of red felt. 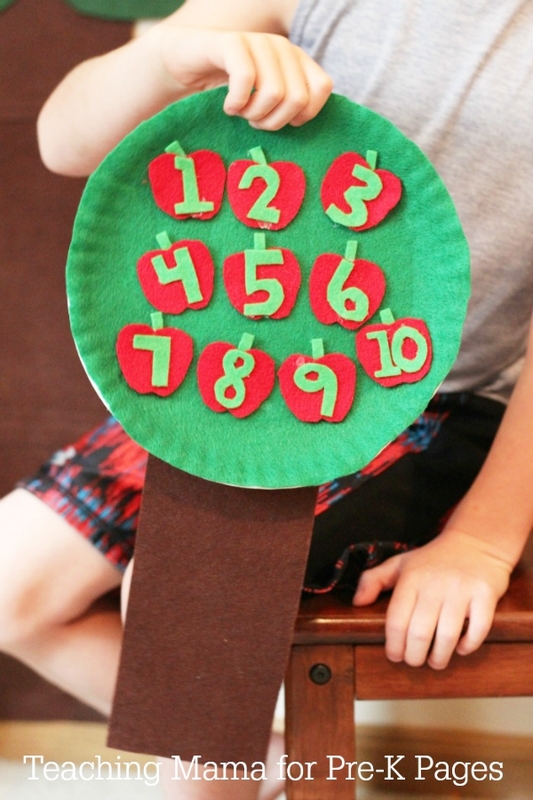 Add a little green stem from felt and glue on the felt numerals 1-10 onto the apples. 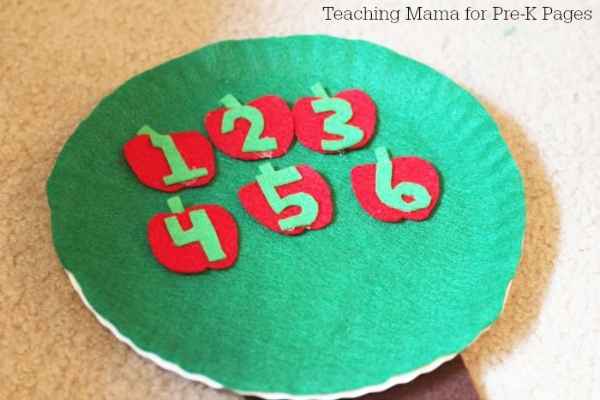 After creating the counting tree, invite the child practice counting with the apples. Read Ten Red Apples again; children can take off the apples as you read the story. turn the apples over (so numbers aren’t showing) and place a small group of apples onto the tree. Have the child practice identifying the number of apples without counting. I highly recommend reading Ten Red Apples aloud to preschoolers. My kids loved the book and these activities would be perfect for fall! BIO: Angela is the writer of Teaching Mama, where she shares hands-on learning activities for babies, toddlers, and preschoolers. She is a former teacher, turned stay-at-home-mom to 3 wonderful boys. She is also the author of The Preschool Journey, a resource for preparing your child for Kindergarten. You can connect with her on Facebook,Pinterest, or Instagram. We’re featuring you this week on Good Tips Tuesday!!! Thanks for linking up! I think your felt apple tree is awesome and looks pretty easy to make.